Separation of toxins with magnetic particles. Why is it so important? The use of magnetic particles has recently expanded for a process known as detoxification in which different toxins are extra-corporeally captured from the bloodstream of intoxicated patients. The detoxification of biofluids is the most conceivable treatment in a high number of clinical conditions, some of them associated with high mortality rates such as sepsis. This is a lethal disease caused by a microbial infection that spreads through the bloodstream to overwhelm the body’s defenses. It represents the primary cause of death in hospital intensive care units, afflicting 18 million people yearly and accounting for over 200,000 deaths annually in the United States alone. The mortality rate can increase as much as 9% for every hour before the administration of the correct therapy. Hence, rapid elimination of the toxins is of paramount importance even in state-of-the-art hospital intensive care units. We found that the limitations of the current treatments require the development of novel strategies such as the use of magnetic beads as toxin sequestering agents. Due to the magnetic properties of the particles, once the capture of the pathogens is complete, their separation from the patient’s blood can be performed in a continuous process using an external magnetic field generated by a permanent magnet. From the multiple magnetic microseparators developed in the last decade, we proposed the use of two-phase continuous-flow systems. These systems may be the best alternative because any flow restrictions and any degradation of the biofluid (i.e., non-specific entrapment of cells in the capturing region) are avoided, thus maintaining the efficacy and capacity of the system over time . However, the optimization of these processes has been less studied and rational design is often lacking because of the complexity associated with their mathematical description. Therefore, we modeled the separation of magnetic beads from flowing blood streams inside a multiphase system with FLOW-3D in order to optimize the design of extracorporeal detoxification processes. In the proposed separator design, shown in Fig. 1, the beads are continuously injected through the upper inlet, deflected by the application of a magnetic gradient and collected into a flowing buffer stream. In order to achieve the efficient separation avoiding the mixing of the fluid phases, magnetic and fluidic forces were carefully studied and optimized. A detailed study of particle-fluid interactions as the beads are deflected is also provided. Figure 1. Schematic diagram of the proposed microfluidic bioseparator (adopted from ). The model for predicting the magnetophoretic particle transport inside the bioseparator shown in Fig. 1 consists of a CFD-based Eulerian-Lagrangian approach. We used the Lagrangian framework to model the bead dynamics, whereas the fluid transport, which is predicted by solving the Navier-Stokes equations, is calculated with an Eulerian approach. According to the Lagrangian approach, particles were modelled as discrete units and the trajectory of each one was estimated by applying classical Newtonian dynamics. Although different force contributions act on the particles during separation, we considered only the dominant magnetic and fluidic forces for predicting the bead trajectories under magnetic gradients generated by permanent magnets. We obtained different particle trajectories and thus, separation efficacies, by varying the distance between the lower wall of the channel and the top of the magnet, while keeping the same inlet velocities of the fluids (0.035 m·s-1 for the buffer and 0.01 m·s-1 for blood solution). More details of the modeling effort we developed can be found in our published work [1, 2]. Figure 2. Particle trajectories (red lines) under different magnetic fields provided by varying the distance “d” between the magnet and the microchannel (adopted from ). The contour plots represent the average fluid velocity magnitude expected in the channel. By varying the position of the magnet, we demonstrated that variable magnetic field gradients are generated, and thus, different separation efficacies were obtained. Figure 2 shows where the trajectories of the particles under different distances “d” between the magnet and the channel: For distances between 0 and approximately 1 mm, all the particles are separated independently of their original position at the inlet. For larger distances, the separation is incomplete due to the low magnetic forces. Medium to high magnetic forces are necessary for achieving complete particle separation. However, we demonstrated that high magnetic forces are undesirable for detoxification purposes due to the extreme acceleration of the particles that leads to perturbations of the flow patterns and to disruption of the fluid interface, as seen in Fig. 3. Therefore, medium magnetic forces appear to be optimum for this kind of system, because complete bead separation can be achieved while maintaining blood integrity. Figure 3. Velocity vectors at the time when the particles are crossing the interface between phases for a) d=0 mm and b) d=1.15 mm; Blood volumetric fraction at that time for c) d=0 mm and b) d=1.15 mm (adopted from ). In this work, we introduced a novel FLOW-3D model for predicting and optimizing the process of magnetic bead separation from blood in a multiphase continuous-flow microdevice. This model takes into account the dominant forces acting on the particles and can be used to study critical details of the separation process, including the trajectories of individual particles, the time required for the separation, and the perturbation of the blood/buffer co-flows. A critical element of this work is that we studied the interaction between two fluids flowing simultaneously in the device while taking into account the effects of particle-fluid interactions in the flow field. These issues are very important since the solutions should flow independently along the length of the channel and be separated at their respective outlets, avoiding any possible blood loss or dissolution. The methodology followed here provides a rational design guide since it can be used to predict particle separation by taking into account key operational variables and parameters. It applies generally for parametric analyses and optimization not only for blood detoxification processes, but also for other studies that involve multiple confined liquid phases inside microfluidic devices. Our future work will focus on the experimental analysis of the process using whole blood and the integration of the magnetic separation stage with the removal of the toxins in order to design novel detoxification processes . 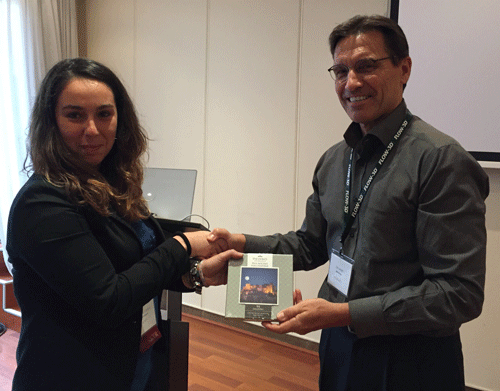 Jenifer Gómez-Pastora accepts the best presentation award from Thomas Jensen, President at Flow Science, at the 17th FLOW-3D Users Conference, which was held June 5-6 in Barcelona, Spain. Financial support from the Spanish Ministry of Economy and Competitiveness under the projects CTQ2015-66078-R (MINECO/FEDER) and CTQ2015-72364-EXP/AEI is gratefully acknowledged. Jenifer Gómez-Pastora also thanks the FPI postgraduate research grant (BES-2013-064415). Edward P. Furlani gratefully acknowledges financial support from the U.S. National Science Foundation, through Award CBET-1337860. Gómez-Pastora et al., Separation and Purification Technology, 2017, 172, 16–31. Gómez-Pastora et al., Journal of Physical Chemistry C, 2017, 121, 7466−7477.